Publishers often change names over the course of their histories, as they restructure internally or merge with other publishing houses. For example, when Westminster Press merged with John Knox Press in the early 1990s, the publishing house Westminster John Knox Press was created. In bibliographic entries, the name of the publisher should match the name of the publisher at the time a work was published, regardless of the publisher’s current name. This principle holds even when the organization responsible for the publications remains the same even as the name changes. For instance, beginning in 1974 Society of Biblical Literature volumes were published by Scholars Press, a consortium of various academic societies (e.g., Society of Biblical Literature, American Academy of Religion, American Schools of Oriental Research, Brown University). 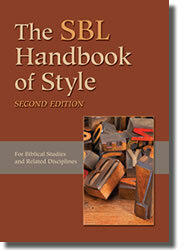 When Scholars Press dissolved in 1999, SBL books were published under the name Society of Biblical Literature. Then, in the middle of 2014, SBL established the SBL Press imprint, and it is under this name that current SBL books are published. Friedman, Richard Elliott, and H. G. M. Williamson, eds. The Future of Biblical Studies: The Hebrew Scriptures. SemeiaSt 16. Atlanta: Scholars Press, 1987. Copier, Laura, and Caroline Vander Stichele, eds. Close Encounters between Bible and Film: An Interdisciplinary Engagement. SemeiaSt 87. Atlanta: SBL Press, 2016. For more information on the history of Scholars Press, see here. For more on the history of SBL publications, see Saunders 1982. Saunders, Ernest. 1982. Searching the Scriptures: A History of the Society of Biblical Literature, 1880–1980. Chico, CA: Scholars Press. Freely available online here.